Small can be great. Our countertop displays have been placed on cash wraps, counters, shelves, and gondolas. Countertop displays can be pre-loaded cardboard displays that are self-shipping. We have produced countertop displays that are part of larger programs; one example is a single spirit display on a counter that has a merchandising unit nearby. Small displays are great when you want the consumer to touch and feel the product since they are usually placed in very accessible areas. 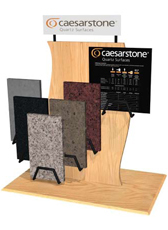 Request a quote today or contact Simply Displays for custom countertop displays for your business.